*The paint color in this room is Benjamin Moore’s Cape Hatteras Sand. I loved this color so much that we used it in another room as well. 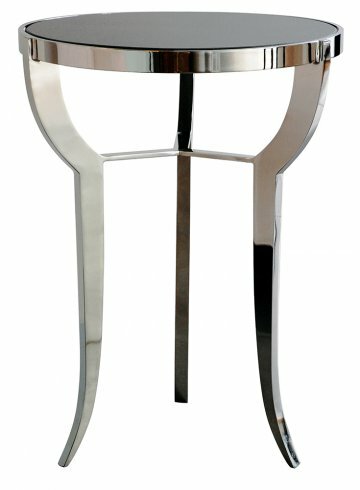 The side tables are by Powell and Bonnell. I originally found them on Decorati, and it was Lauren’s idea to add the marble tops. The little balloon dog on the mantle was the biggest hit of all! The majority of questions were inquires about this little dog. Kelly and Victoria of Design Ties, liked it so much that they tracked it down and found them for sale at Anima Causa Boutique. Mine came from Maison 24. And again, as many of you had correctly guessed, it’s a “tongue and cheek” version of the famous Jeff Koons balloon dog sculpture. Finally, here is a shot of the living room, during the renovation. We added to the size of this room by building out. The new addition runs from the white pipe (left of the fireplace) all the way to the ladder on the right. We also took a wall out and combined this new longer living room with a small sun room on the left, making one very large “L” shaped living room. The new living room is now much more conducive to entertaining, and well…living! Thank you all so much for the supportive comments and the really thoughtful questions on our living room renovation project! 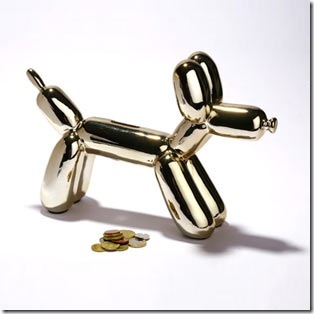 I love the art and the balloon dog sculpture…Such a great post! Benjamin Moore's paint sings to my soul, Sue! I especially like his Elephant Gray shade. its a beautiful room Sue, and the doggy is the cutest! Beautiful home! You really outdid yourself! This is going straight to my inspiration folder as we work on my boyfriend's house. And I've been searching for the perfect grey for the kitchen and this might be it! Seriously the little dog is perfect! Thanks for naming your gray – I love it! It looks like a magazine! I know that sounds cleche' but I'm so serious! I love the detail of the bottom of the sofa. And the large basket of wood is such a great idea! It's all very lovely. Love the cut velvet pillows in those chairs too! Really great space. M.
Love a play by play! The balloon dog is the cutest thing, but the AT painting…I want it!!! It really is a beautiful room! I don't think I'd want to leave! "Tea Time" Print Giveaway-Come on Over and Check it Out! i know the reno ALL too well – being i gutted my entire house (just inside tho, i didn't expande or redo outside yet) .. and best of all – i did it ALL MYSELF! .. took me a long time, but i'm also not in a rush .. i'm pretty handy – had to contract out things – but i was involved with every pipe, wire, sheetrock screw – everthing – i was SUPER picky! .. NEXT i would love to raise the roof in my house to make the 2nd floor MUCH larger – but for a single gal ( i keep having to remind myself that) – it's FINE for now .. I love every single detail! The artwork is fabulous, the little dog is beyond perfection for the space, the table is perfect for looking great and fitting the bill of having children in the home, the side table is eye-catching, the trim on the sofa is fabulous (love, love, love) and the entire room is fit for a magazine layout!! Thanks for sharing! it's so amazing!!!!!!!!!!! I love that paint color. Gorgeous! Honestly, I am not a beige/grey fan for my house, but this room is STUNNING! I just forwarded this post to a client to recommend your paint color for her entryway. BEAUTIFUL! Wow, the room looks so amazing, everything looks perfect! Your room is beautiful thanks for the inside scoop! You did a wonderful job! It is absolutely beautiful! Looks amazing – straight out of a design mag. The molding is gorgeous. So very beautiful! So many great choices! I am a HUGE fan of Amanda's art. I want a piece for my dining area soooooooooo bad. I don't know if I could even afford it, wonder how much it would be? I need to go see her since I am only 45 min away from New Orleans! Love love your living area! Completely gorgeous!!! It is very serene and light feeling. Love the artwork and the balloon dog!! Gotta have a bit of humor right?! Fabulous job!! I think you did an amazing job. It all comes together beautifully! This is NOT your living room?!!! Ah, when can I come over?!!! Thanks for sharing! Again, your living room is beautiful! Such a treat to see! Thank you for sharing! I love everything and I am so excited for you. Change is exciting and the possibilities seem endless. I think your painting just makes the room. and isn't it funny how a little whimsey like the dog piece can kick a room up! your taste is impeccable,chic,simple and with superb colors that complement each other.Fabulous taste and choices.love everything! Thank you for sharing your little secretes here. That is very cool that you can get a painting customized, i like that idea! Pure perfection!! I want more! Hubby & I plan to add a fireplace. Would you mind to share more pics of the fireplace? How did I miss this, Sue?!?! Clearly I'm woefully behind on my blog reading! In any case, it looks fantastic. I LOVE LOVE your color palette and the mix of modern with traditional — it's fresh and playful, but still some seriously good design. Wow! What a great renovation! I especially love your paint color and the type of crown molding you chose! That looks like an incredible living space indeed. And the balloon dog is such a great touch! Stunning space! Thanks for sharing the paint color. I love it all Sue! 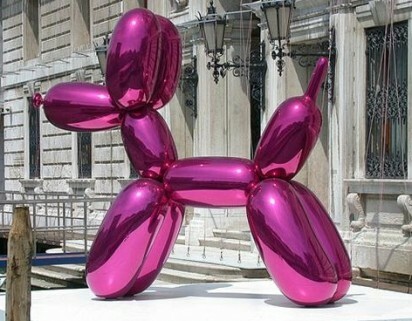 The paint, the art, the fabulous balloon dog (I really enjoyed the post over at DesignTies). It's neat to see the before photo as well, thanks for sharing all the details!! The whole room is gorgeous and I'm extremely jealous! Can't wait to see the rest of the photo shoot. I thought that looked like a Jeff Koons' sculpture. Lovely and elegant interior! Thanks for sharing the paint color.. looks fabulous . one word…. Elegance! wow you did such an amazing job! It's just such a gorgeous space! I love the wall color. Sue – it's stunning – you did a great job!! This room is beautiful. From the couch to the pillows, side tables, rug, painting and curtains. I love it all! Hope to see more of your home reno soon! What a beautiful room – thank you SO much for inviting us into your world! 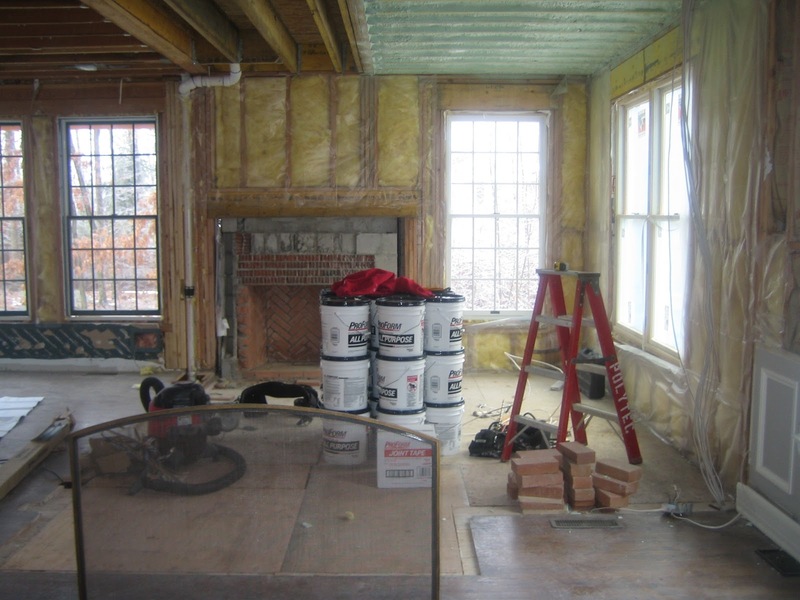 I especially appreciated seeing the before picture (or rather, the in progress picture) – it gives me hope that a raw space can be transformed into such a finished product. 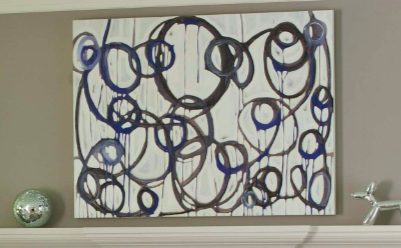 Love the Amanda Talley and the balloon dog sculpture – they are the perfect finishing touches. Your living room is so chic! I love it…and I love this paint color! It looks great with the purple and green accents. I just love it! That painting is beautiful! I've made note of the paint color (I'm a NC girl so anything Cape Hatteras brings fond memories of great summers)! Thanks for sharing! love the art! and the tables…both are so pretty! This room is perfection. Thanks for sharing some of the magic. It's so edited. It really is just perfect! Thank you so much for posting the details! I absolutely love love—lOVE the finished deal. So much zing! So classy and full of personality, the best kind of design! What a gorgeous living room you have there! Thanks for sharing the deets! This is extraordinary! What an absolutely gorgeous room. Such a beautiful space!! You did an amazing job. Where is the rug from? I loooove it! just found your blog and have a major desire to (buy my own house) and then decorate it! I really like this room! The paint colour is beautiful. Thanks so much for sharing! Looks amazing! We used Cape Hatteras Sand in our kitchen. It is such a great color. I love the little dog! It is amazing! Thanks so much for sharing! Thanks so much for linking back to our blog and Kelly's post on DesignTies! I didn't see Kelly's post before she published, but when I did I couldn't stop staring at the photo of your living room… I even tucked a copy of the pic in my inspiration folder! Everything is FAB!! And I really want a balloon doggie!! I missed your room the first time around. It is beautiful and can definitely see it in a magazine. There's so much prettiness to look at -love it all! And I want that coffee table! I swear, I thought that image was from a magazine. For sure. It's looks stunning! I'm with Designstiles, I immediately thought the room was styled by a pro, it's absolutely gorgeous! Enjoy your new space, it must be nice to have the remodel behind you. You did a great job, it's wonderful ! Love love love your home! Is the paint Cape Hatteras Sand more of a gray or beige in person? Thank you! I love your living room! Is that color, Cape Hatteras Sand, more of a beige or more of a gray? Thank you!